What an exciting week! My husband Joe and I have been looking for a dog to bring into our home for several weeks now. We've visited the pound, searched web lists, etc. trying to find just the right companion for our Herbie. Herbie is a 4 year old male lop rabbit. He was a rescue as well. We got him to bond with our female rabbit Luna who had survived two other bunny husbuns. Luna passed away about two years ago and Herbie has been a bachelor ever since. He seems to think it's fine, not having to share treats or attention with another rabbit, but we think he would like to have another animal to share his life with as much as we would. 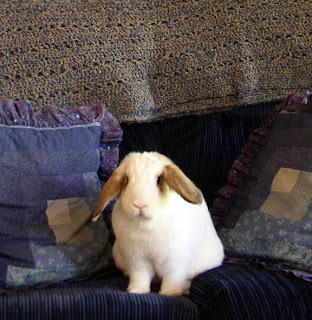 Herbie is an extremely friendly and extroverted bunny, but when it comes to other animals (ie. the cat the came wandering into our house one day), he is pretty terrified. So we've been on the search. Debating...puppy or adult dog, what breed, etc... We settled on going with a herding breed because of their high intellegence and good behavior with other animals. We had both had Shelties growing up so that was an option. But, we also were looking at Corgies, Border Collies, and Autrailian Shepherds. The smaller the better since we have a smaller house. We found a few Corgie/Border Collie mixes, a few Aussies, but nothing seemed quite right. Of course we were tempted to go with a puppie because of the cuteness factor. However, we thought a puppy might be too scary for Herbie with sudden movements, wanting to play etc. So, well trained adult dog it was. We kept our eyes open for a few weeks, and as soon as we saw the posting, we knew we had found the right dog. 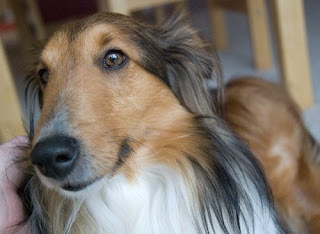 Millie is a 4 year old Sheltie, EXTREMELY well trained, and abosolutely the sweetest dog you've ever met. Her family was being forced to give her up because they had a toddler in the house that was terrorizing her. Millie ended up having to live most of her time outdoors to avoid the child. And so, her family thought it would be best for her to go to a home where she could have loads of love and and indoor home. We brought Millie home last Friday. We've been spending the last few days getting to know her and visa-versa. She is a wonderful dog. Day 1: Herbie's space is in the laundry room. When we're at home, he's free to roam the house - in particular the living/dining room. The laundry room is normally closed off by a baby gate, but for the meantime, we'll keep the door closed to eliminate any suprise encounters. Now that Millie is here, her space will be our bedroom. This is where she will go when Herbie is out for his runs. We brought Millie home this evening. She spent the evening exploring the living room area and getting to know us. Towards the end of the evening, we put her in the bedroom and allowed Herbie to come out and have his usuall romp. As soon as his little paws hit the living room carpet, he knew something fishy was going on. He darted to his little corner, and told us how unhappy he was for several minutes with lots of thumping. We didn't force him to roam around tonight, just get used to the unusual smells. Day 2: Millie gets a bath, a leash, and some breath cleaners...she's very stinky from being an outdoor dog for several months and she needs a beauty treatment. She spends the remainder of the day lounging in the center of the living room on the rug, her new favorite spot. She seems completely disinterested in sniffing around Herbie's favorite living room areas. In the evening we put her in the bedroom again and allow Herbie out. By now, he knows he doesn't even want to leave the laundry room, but we force him out and shut the door. He retreats to his corner in the living room. Very little thumping tonight, just very jumpy. Towards the end of the evening we coax him out with a little apple. He grabs it and runs right back to his hiding place. Day 3: Same routine, except for an improvement in Herbie's behavior. No thumping. He's curious enough to come out of hiding, sniff around a bit, beg for treats, and lay down for pets in an area that Millie was previously sleeping. Day 4: Continued improvement. We don't have to force Herbie from his room any longer for his run at night. Just a little apple coaxing does the trick. He roams around the living room, even venturing out onto the rug that Millie has been lying on all day. I've also been trying to mix their scents a bit, brushing each animal with the other's brush. At this point, I think we're almost ready for a visual introduction. I'll let you know how it goes!